Growing up, my dad did quite a bit of work travel so my mom, sister and I ate out frequently. Nothing fancy, Taco Bell was a regular stop but Chinese, good ‘ol American Cantonese Chinese food, was a particular favorite. You know the place … Chinese calendar placemats, plastic chopsticks and a menu filled with dishes like chop suey, sweet and sour pork and egg rolls. Our particular favorite in our little corner of Phoenix was Ho-Wah, a small family restaurant across the street from my future high school where the owners would warmly greet us and knew our order by heart. We probably went once a week and I loved it. Though sadly long gone, it is the standard against which I still judge all Chinese food. We had a regular order: hot and sour soup, egg rolls, Ho-Wah sizzling chicken and char sue ding. I honestly do not remember ordering anything besides these few things. We must of ordered something else at some point. Maybe sweet & sour pork, a favorite of my sisters? Won ton soup certainly? A pu-pu platter perhaps? I have no recollection but those four items were our regular order, followed up with fortune cookies, almond cookies and copious amounts of hot tea. I’ve yearned for these dishes ever since the restaurant closed sometime in the mid ‘80’s. I’ve found something similar to the sizzling chicken dish at a local restaurant – chicken deep fried in a puffy batter with bok choy, mushrooms and snow peas in a brown gravy but it’s not served on a sizzle platter. I often wonder if asked, if they’d do it. I know they have the platters, I’ve seen them used for other dishes, but I’ve been too shy to ask. I can easily get hot and sour soup and good egg rolls but the char sue ding has proved illusive. 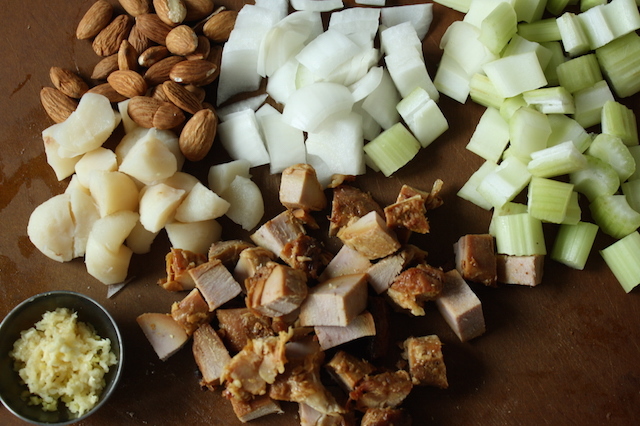 “Char sue” is Chinese bbq pork and correctly spelled “char sui” and the “ding” typically refers to almonds. 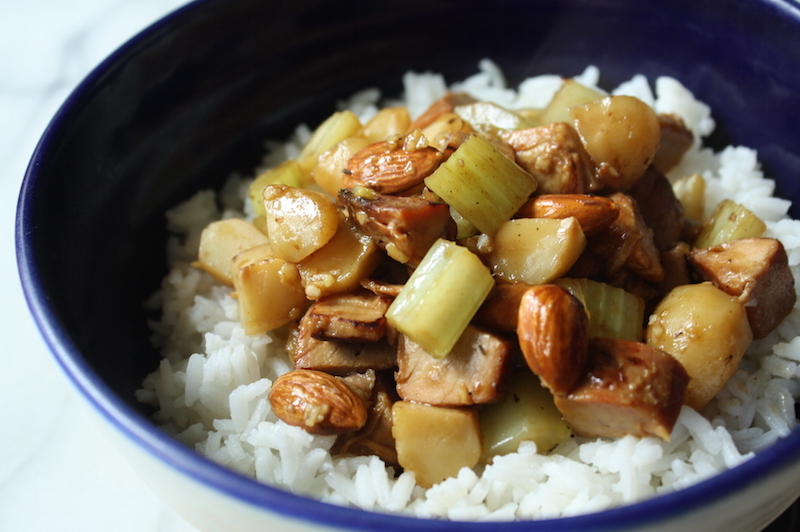 I see chicken almond ding frequently on menus but rarely a pork version. Even then it’s not quite like I remember; the sauce is never quite right or the vegetables are all wrong. Taste memories are hard to recreate but I decided to go out on a limb a few years ago and start making this for myself. It wasn’t really all that hard and I now make it often when the craving hits. At first, I made my own char sui pork, but since I can easily ask my local restaurant for a ½ pound to go, that’s what I do now. While homemade is good, buying is much easier. 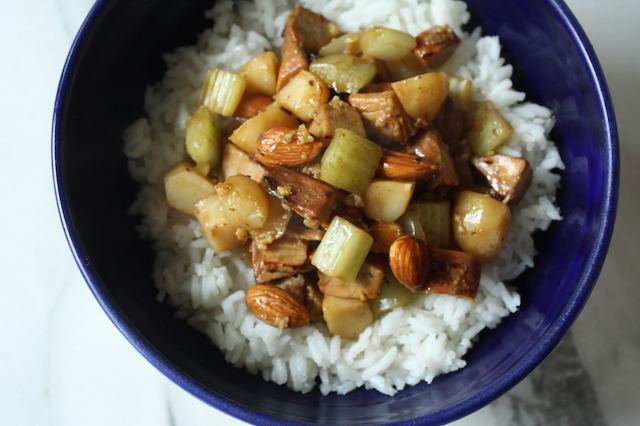 Stir-fried with celery, onions, water chestnuts and almonds then tossed in a slightly thickened brown sauce, it comes together quickly and easily. It is the perfect dish to make when you’re staring at that bunch of celery wondering what to do before it turns. It has a few ingredients that might require a special trip to an Asian grocery store – Shaoxing rice wine in particular – but the process isn’t difficult. The prep work takes longer than the cooking process and that isn’t even that much. Round everything up and you’ll be rewarded with a dish full of flavor and crunch that is mighty delicious. The sauce might not be 100% true to the Ho-Wah version but it tastes pretty close to me. At some point I may just figure out that chicken dish too. Because what I need in my life are some specialty sizzle platters I’ll rarely use. Oh sure. Side note: if you enjoy this type of old school, American-Cantonese food you really should watch “The Search for General Tso”. It’s on Netflix and it is fantastic. STRESS THERAPY BAKING FACTOR: HO-WAH GOODNESS. This brings back so many happy memories for me and I absolutely love the contrast of textures and flavors. Once you round up a few ingredients and the bbq pork, it’s pretty straight forward – just a simple stir-fry really. Invest a little time in prep – slicing and dicing – and you’re off to the races. Though I think it falls firmly in American Cantonese camp, maybe make some Saturday to celebrate Chinese New Year. It’s the Year of the Rooster! When cutting up the vegetables and pork, make sure they’re all about the same size so they cook at the same rate. If you don’t have a wok, grab the biggest skillet you have (don’t use non-stick) and fire it up. In a small bowl, whisk together the cornstarch and water until smooth. Combine the cornstarch mixture in a bowl with the remaining sauce ingredients – chicken stock, soy, rice wine, pepper and hoisin – whisking until smooth. Set aside until needed. Heat a wok over high heat until screaming hot. Add the vegetable oil and stir fry the celery and onion until tender, about 3-5 minutes. 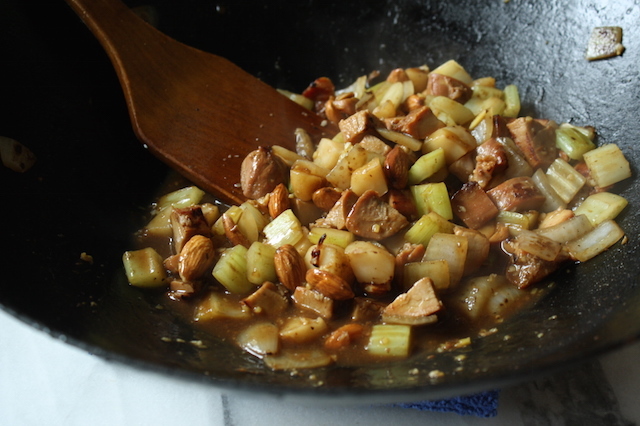 Add the char siu pork and water chestnuts; stir fry until heated through. Add the ginger and garlic and stir fry until fragrant, about 1 minute. Give the sauce ingredients a quick stir to combine and add to the wok, stirring quickly to combine. Cook for 1-2 minutes until the sauce thickens. Thank you so much for this recipe. Many happy meals were consumed at little Ho-Wah. And your correct…I also don’t remember eating anything different there. Now I just have to find someplace to pick up the pork. You also have me salivating for that darn sizzling chicken.